A year after a car slammed into the NY Irish Hunger Memorial the damage has still not been repaired. It is a disgrace that almost a year after a car slammed into the Irish Hunger Memorial in New York the significant damage has not been repaired. The memorial is located in Battery Park, just a short distance from Wall Street. 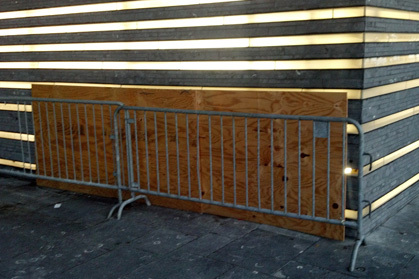 Instead a cheap plywood fixture covers the gaping hole in the outside structure and a metal barrier stands in front of it. No attempt has been made to fix it permanently by the City of New York or Battery Park authorities. One can only imagine if a car slammed into the Metropolitan Museum or some other august structure how quickly the city would find funds to repair it. Yet the Irish Famine memorial is obviously considered a very low priority. The Famine Memorial in Battery Park City is actually considered sacred ground by many Irish Americans since it was opened by Irish President Mary McAleese in 2002 in a very moving ceremony. I was there on the day and still remember it as one of the highlights of my time in America. At last a permanent memorial to the millions of Famine Irish would be present in America’s greatest city. The quarter acre site beautifully replicates a deserted famine village in the West of Ireland, including a ruined cottage imported stone by stone from Ireland and plants and bushes and grass from every county. I know many who were moved to tears when visiting the memorial with its extraordinary evocation of the era of the Famine and the million who fled. Kudos to Kevin Ellis head of the AOH DIvision 1 in Yonkers who first noticed the damage had not been repaired and decided to try and do something about it. He said what is there now is an eyesore and a disgrace. The damage occurred in August 2012. DNAInfo.com reported on August 13 that year that a speeding car plowed into the Irish Hunger Memorial. A shirtless man later named by police as Antoine Odom, 24, of Long Island was driving the car which was stolen. Police say he was under the influence of drugs. The Battery Park City Authority manages the memorial. It is time to ask them and the batch of Mayoral candidates whether they will commit to restoring the Famine memorial to its proper structure without unsightly plywood and barricades used to close up a gaping hole. Those who came before us would ask for nothing less.